‘Til death do us part.” This well-known part of most wedding vows takes on a new meaning as couples celebrate the 50th anniversary of their wedding day. That is why couples (or their families) who reach this touchstone within their lifetimes often make sure that the event is celebrated with flair. 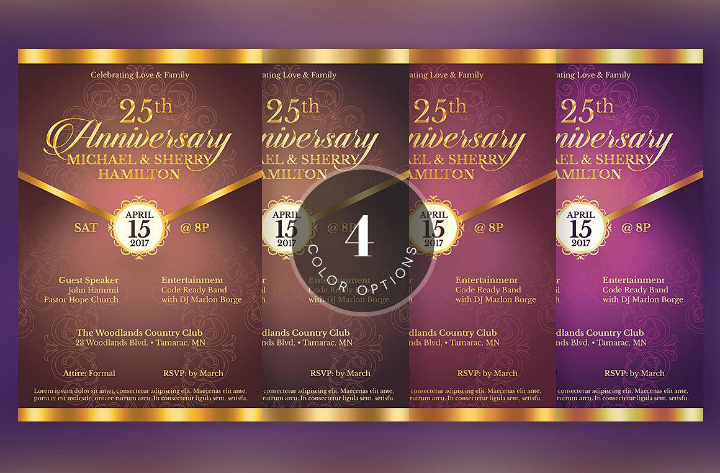 So, if you are planning a great golden wedding anniversary bash, be sure to check out the rest of this article for more information on how to create, find, and use the best 50th wedding anniversary invitation templates. Embedded below are multiple anniversary invitation templates that can be used for 50th or golden wedding anniversary celebrations. We have scoured the internet for the best downloadable wedding anniversary party templates that can be purchased, downloaded, and then printed out with ease. You will surely find a wedding anniversary template design that will suit your preferences. Take a look! An anniversary is a yearly celebration or commemoration of an event. In particular, wedding anniversaries were first recorded during the early Middle Ages where husbands present their wives with silver headdresses or wreaths for their 25th year as a married couple. In the modern age, wedding anniversaries can be celebrated yearly depending on the couples and their family’s preferences. And thanks to commercialism, there are now traditional and modern anniversary gifts suggested that the couple should give to each other. Guests to a wedding anniversary celebration are also suggested to base their gifts based on the couple’s number of married years. To illustrate, the traditional first wedding anniversary gift used to be paper or cotton while crystal, china, silver, pearl, ruby, sapphire, gold, emerald, diamond for the 15th, 20th, 25th, 30th, 40th, 45th, 50th, 55th, and 60th wedding anniversaries respectively. Today, there also are suggested flower gifts for couples celebrating their wedding anniversaries. Those who are celebrating their 50th or golden wedding anniversary should receive violets. Another gift idea for a wedding anniversary is a gemstone. Spouses are supposed to give gold gemstones or pieces of jewelry during their golden wedding anniversary. Note that these anniversary gift ideas are only suggestions and couples (and their respective family members, friends, and relatives) are not required to take it seriously. What is important is that the couple is able to celebrate half a century of being together. After all, it is not an easy feat to achieve in a world of divorce and shortening life expectancy rates. There are two main ways to create any kind of wedding invitation card. These are through 1) the use handmade crafting materials and 2) the use of digital printable templates. Each invitation card-making method has its own pros and cons which we will all discuss further below. However, the main disadvantage of using handmade anniversary invitation cards is that they take up a lot of time and effort to create. Unless you have a lot of people working for you and are mad about producing these handmade and artistic cards, it will be truly inefficient to follow this card-making approach. So, if you still like the idea of creating handmade anniversary invitation card design, perhaps it would be better to determine the total number of invitation cards you will be creating. For example, you may choose to only give out the anniversary invitations to immediate family members while you may come up with another way. The second and perhaps most popular method in creating invitation cards is the use of pre-made card templates. These are digital files that come with pre-formatted design elements so that you will not have to create an entire template from scratch. This method in invitation card creation is preferred for those who do not have ample knowledge in graphic design or those who do not have enough time to create handmade invitation cards and/or design their own anniversary cards. Pre-made wedding anniversary card templates are also preferred by those who are on a budget since these wedding anniversary templates only cost a few dollars at most. When creating a budget plan for your wedding anniversary party, it is important to also consider the total printing costs in addition to the template cost. Doing this will allow you to accurately calculate the total expenses required for your wedding stationeries. Presented above are the two main ways in order to create a wedding anniversary invitation template or any kind of invitation template for that matter. If you have all the time and resources in the world, you can easily combine these two methods. The end result will surely amaze your guests and the couple themselves. Happy crafting! Let’s admit it, couples celebrating their fiftieth wedding anniversaries will surely be in their golden years. And sometimes it is not polite nor reasonable to ask them to plan their own wedding anniversary celebrations including the selection of their wedding anniversary invitation card template design. It is usually the couple’s family members and younger friends who get to plan and work out the details of the wedding anniversary party or celebration. With that in mind, we have listed the key things that should be included or written down on any wedding anniversary card template. This is to make sure that all your anniversary event guests are informed of what the celebration is for and how to act accordingly. Note that the items listed below are only suggestions. As the event planner, you are free to add, remove, and transform the couple’s 50th wedding anniversary card‘s template design. Event location, date, and time. Celebration theme or motif (if applicable). RSVP card or response card (if applicable). Event organizer contact information (phone number, email address, website URL, or social media links). Wedding design element originally used on the couple’s wedding day (like wedding monogram, or wedding logo design). Couple’s wedding day photo (if you want to put pictures on the invitation card). Other important messages for attendees. Why Should You Use Wedding Anniversary Invitation Templates? 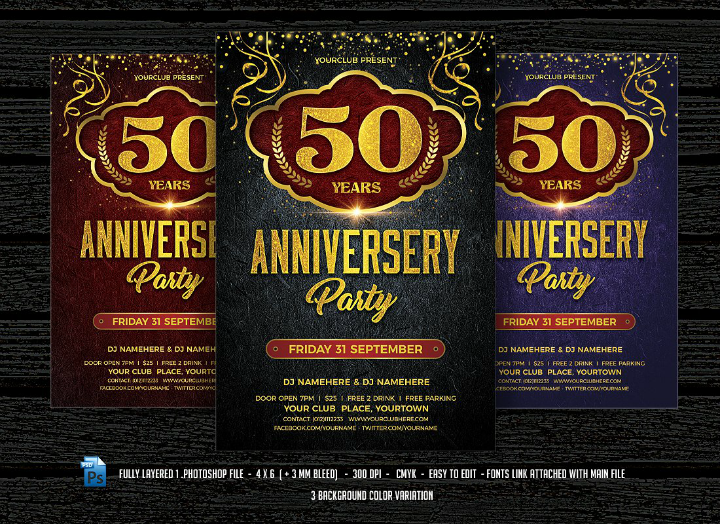 If there is one main reason why you should use a pre-made printable invitation template for an upcoming 50th wedding anniversary celebration, it should be the total convenience that these templates will bring to your event planning life. But, if you are still unconvinced, check out the rest of this article for practical reasons on how using these pre-formatted can help you and the golden couple. Any kind of pre-made invitation template will come in organized layers of text boxes and image placeholders. This makes it relatively easier to edit even if you only have limited graphic design and editing skills. In most cases, all the editing you need to do is just to replace the text boxes with the names of the couple and the wedding anniversary event details. In fact, you may request the original creator of the wedding anniversary template that you like to make the template customizations on their end. Note that this kind of customization option may not be available for all wedding templates available online; and if they are available, you will need to pay an additional fee. Another advantage of using wedding anniversary invitation card templates is that they cost lesser than having to hire a professional graphic designer who will create an invitation template design for you. Families who wish to celebrate the golden wedding anniversaries of their parents also do not need to worry about needlessly spending on trivial anniversary party stationeries. 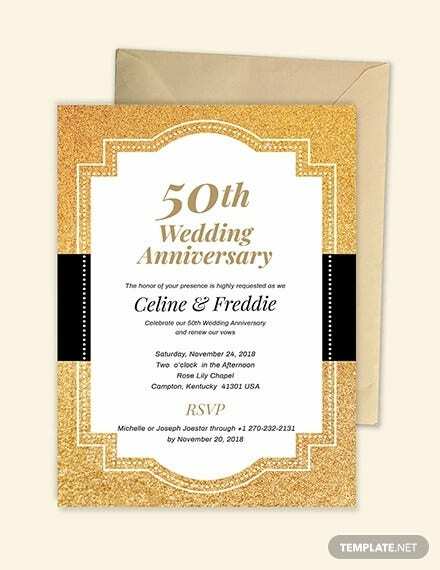 For those who are tasked with customizing a couple’s 50th wedding anniversary invitation card template, you will find the task instrumental in allowing you to enhance your graphic design and editing skills. In addition to contributing to your grandparent’s or parent’s golden anniversary celebration, you are also learning something new on the side. This may only be a trivial skill to learn at the moment but once your skills improve, you can use it to start a side hustle. Using pre-made invitation card templates allows you to save ample time in creating and editing the invitation cards. The templates take away the need to learn about different graphic design software tools and the need to create the invitation card template from scratch. You are then left with more time for printing out and giving away the anniversary invitations to other friends, relatives, and colleagues. Another minor advantage of using pre-made 50th wedding anniversary party invitation card templates is that they can help relieve stress. The use of these printable card templates is so convenient that you do not have to worry about the task at all. 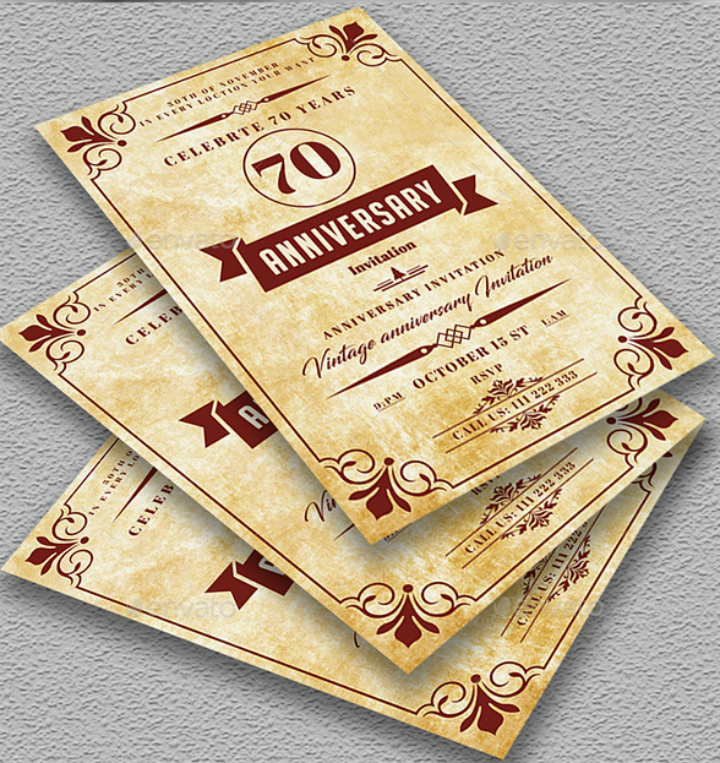 You can give away the anniversary celebration invitations on time since you will be printed easily and quickly. You do not have to worry about learning how to use Photoshop and study Photoshop tutorials since only minor edits are required for the card template that you have chosen. 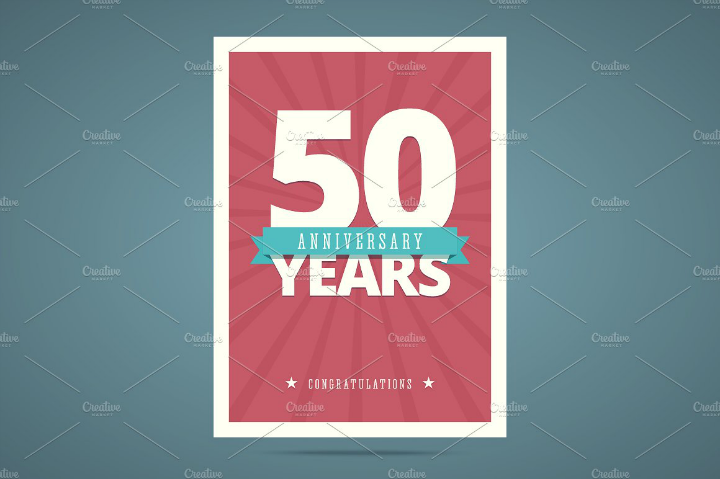 With the use of these printable card templates specifically designed for your 50th wedding anniversary, you can focus on other more important aspects of planning the anniversary event itself. Remember, the design of your wedding anniversary invitation card is not everything. What is important is how the golden couple will feel during the celebration surrounded by the most important people in their life. Only a few couples ever reach their golden wedding anniversaries. These couples and their families are the lucky ones. To celebrate such achievement, it is only right to hold a party or ceremony where the couple can renew their vows and gather all their family members together. But before a momentous event like that could occur, the wedding anniversary event planner still needs to take care of a main event planning task. That is choosing a wedding anniversary invitation design and then sending them out. When choosing an anniversary invitation card template, one of the first things you should look into is if a wedding anniversary invitation design fits the type of wedding anniversary event you want to have. 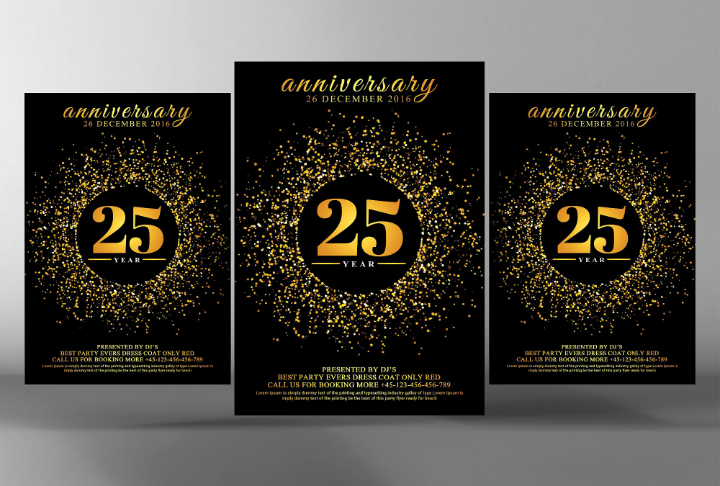 For example, if the couple wants to have a festive party for their golden anniversary, then you should pick a wedding anniversary invitation template that sports festive graphic design elements. An example of that is the Festive 50th Wedding Anniversary Party Invitation Flyer template included in this article. By choosing an invitation card template design that fits your event theme, you are not only catering to the couple’s wishes but you are also letting the guests know what kind of wedding anniversary celebration they will be attending. Another aspect that event planners, family members, and couples should look for in a golden wedding anniversary invitation template is the template’s customization options. 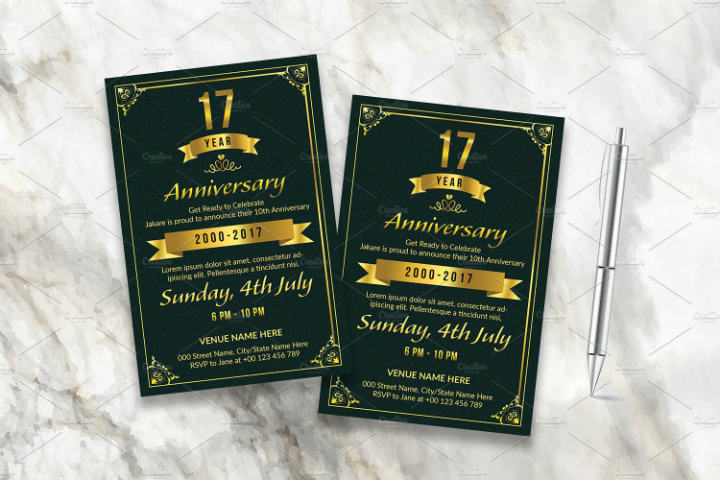 When using pre-made printable anniversary invitation templates, you will need to make minor modifications to the base template. These minor edits will include adding your anniversary event details like time, place, and date. And in order to accomplish that, you will need to choose a printable template that will give you total freedom to make these template changes. 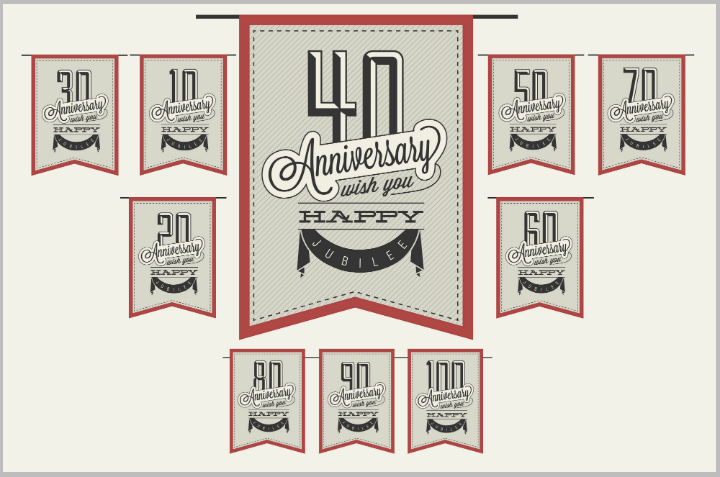 Choose an anniversary invitation template design that has organized layers, image placeholders, and text boxes. This way, it will be easier for you to add, remove, or modify different graphic design elements according to your whim. You can transform a simple but fully customizable template into something truly extraordinary and original with just a few changes to the base template. 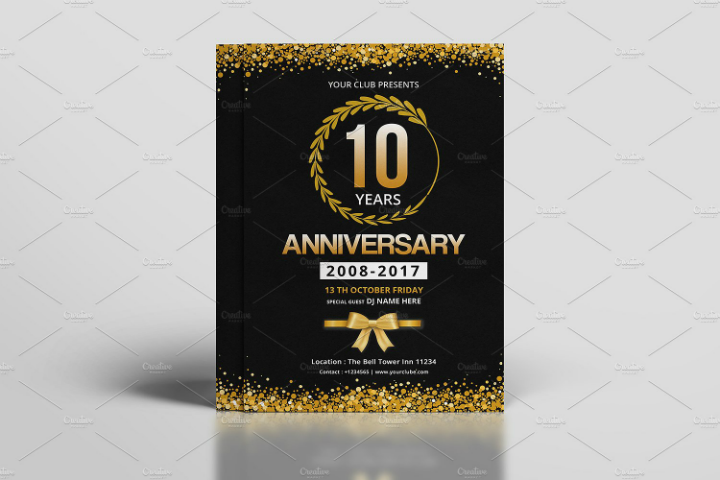 Most of the time, it is best to go for an anniversary invitation template that is created using either Adobe Photoshop or Adobe Illustrator since these file types give you more creative leeway when it comes to editing. It also helps that these two graphic design software tools are the most commonly used. 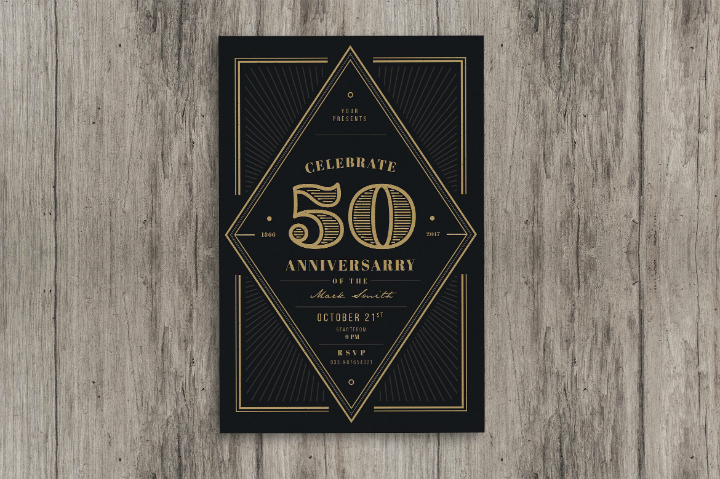 When looking for an invitation template for a couple’s 50th wedding anniversary celebration, event planners should also make sure that they choose a template that is available in their preferred print size. Remember that there are different kinds of invitation templates – from invitation card templates, flyer invitation templates, banner invitation templates, and even email invitation templates. And each of these templates is available in various printing formats and sizes. As an event or party planner, you should decide ahead (with your client’s approval) on what printing size and format you prefer. 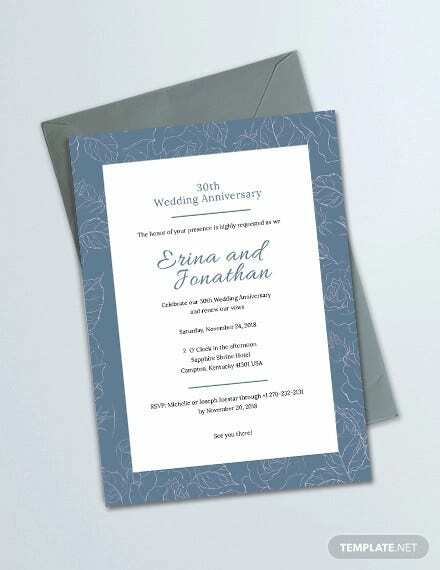 If you want to have an anniversary dinner event for the golden wedding anniversary, it may be best to choose a more formal anniversary invitation card template format. 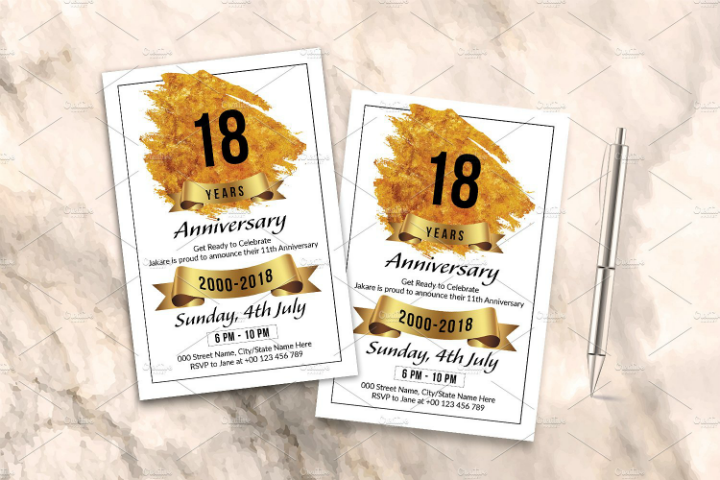 On the other hand, if you the couple’s family is going for a wedding anniversary luncheon party that will be attended by a lot of people, it may be best to go for the wedding anniversary flyer template route. Also, make sure to decide on a printing size so that all your anniversary invitations follow the same size. You may choose among A4 paper size, letter size, bi-fold, tri-fold, booklet, and even rack card printing sizes. It is all up to you. Remember to choose a template format and paper printing size that will best showcase the main design elements in the invitation template that you have chosen. As we have mentioned earlier, Adobe Photoshop and Adobe Illustrator templates are the most common file formats used in creating and storing invitation templates. However, a lot of other printable anniversary invitation templates may also be stored in various file format types like Microsoft Word, Publisher, PDF, Adobe InDesign, etc. This is the reason why event planners should carefully look into a template’s description prior to purchasing it. You should make sure that the invitation template you have chosen is available in a file download format you are knowledgeable about. To illustrate, if you only know how to use Microsoft Word, it would be best to choose an anniversary invitation template that is also available as DOC file download. 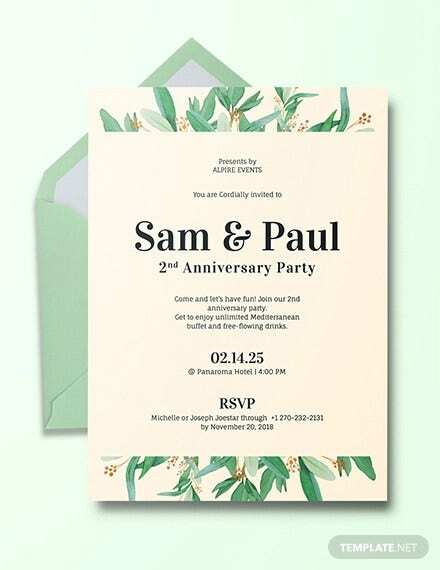 Likewise, if you already have Adobe Photoshop installed on your computer, choose a pre-made printable anniversary invitation template that is already available as a PSD template file. Lastly, another thing that you should look at when choosing a wedding anniversary invitation template is its price. Remember that printable templates only cost a few dollars (usually between $5 to 30). This base rate may slightly increase if you are purchasing a template set or pack composed of multiple printable template types. 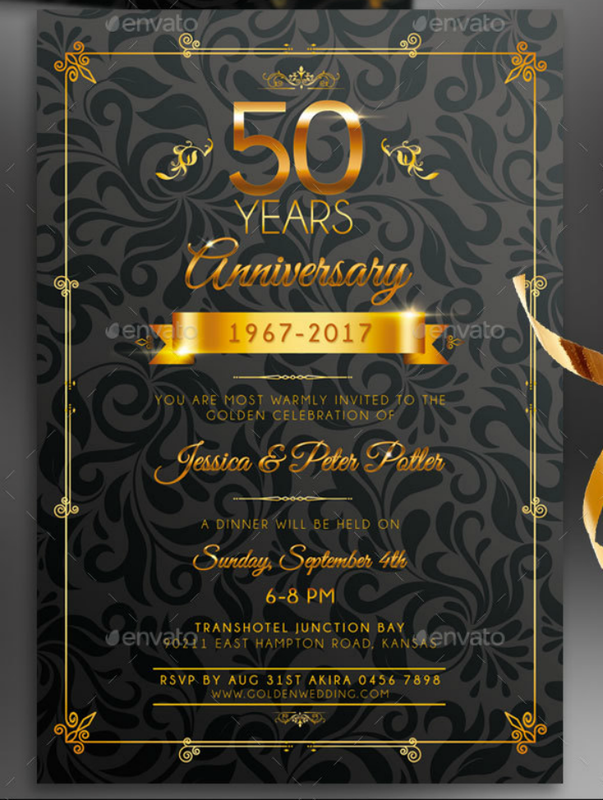 So if you are only looking for a 50th wedding anniversary dinner invitation template, make sure that you choose a template that is priced within the recommended range. Follow this tip and you will save money and also avoid being ripped off. And that’s it! Those are the top five things anyone should look into and consider prior to buying any wedding anniversary invitation template. Internalize these tips and you will find the entire invitation card template selection process easier and more enjoyable. 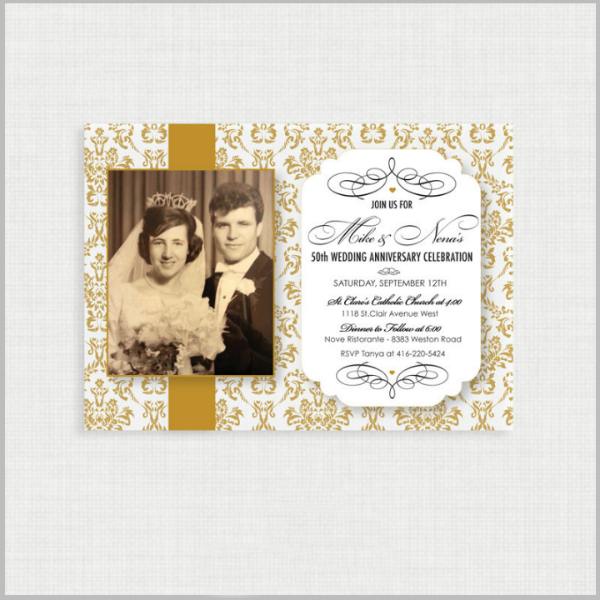 Which Golden Wedding Anniversary Invitation Template Design Did You Like? 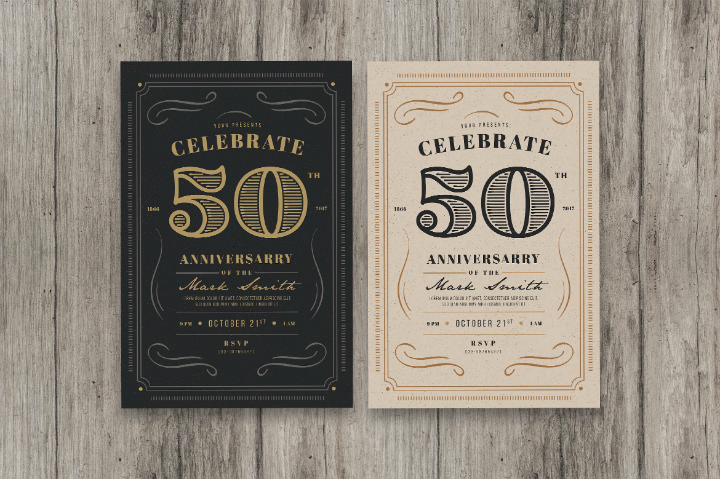 The different 50th wedding anniversary invitation templates curated specifically for this article is to die for. We have chosen each printable invitation card template for their customizability and versatile designs. This means that any of the anniversary invitation templates will suit most of the golden wedding anniversary event themes that couples and families plan around. If you are still undecided or just want to grab and use all the beautiful invitation card templates all at once, take a breather and feel free to refer back to this article once your mind has cleared. This article can easily be bookmarked through your web browser or you can directly save the article link. Also, do not forget to share the valuable piece of knowledge imparted in this article by posting the article link on social media. Your friends, other relatives, and colleagues will thank you for it.